How Do Genetics Determine Eye Color? Eye color is determined by genetics. The color of your eyes, whether blue, brown, hazel, or green, is decided by multiple genes. Many parents-to-be wonder what color eyes their children will have, but the predictions are mere guesses. Most of the genes associated with eye color involve the production of a pigment called melanin. The amount and quality of melanin in the front layers of the iris determines what color the eyes will be. 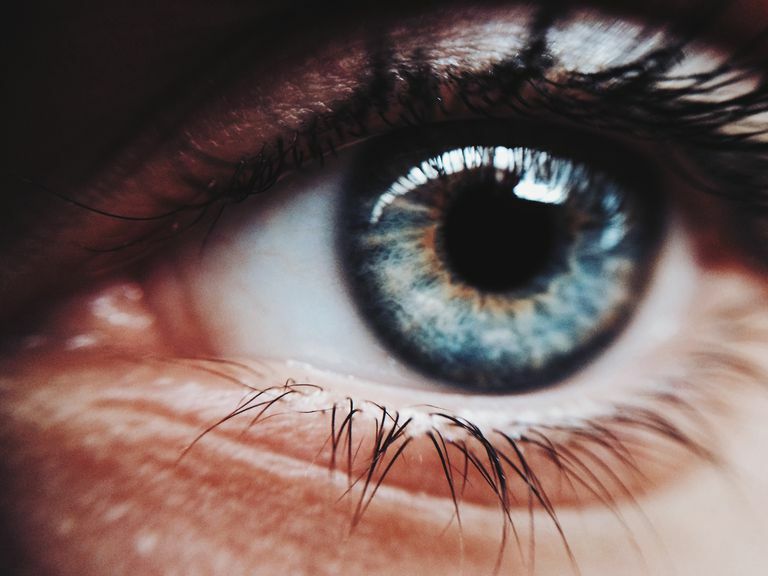 Scientists have determined that people with lighter eyes have a higher prevalence of developing age-related macular degeneration (ARMD) than those with darker eyes. An increased risk of uveal melanoma has been found in those with blue, green, or gray eyes. However, it is also suggested that people with dark brown eyes are at increased risk of developing cataracts. The color of your eyes is actually the color of your eye's iris. The iris is a thin, circular structure inside of the eye, responsible for controlling the diameter and size of the pupil. The color of the iris varies considerably but usually occurs in shades of brown, hazel, green, gray, or blue. The only pigment that contributes to normal iris color is melanin. The amount of melanin contained in the iris helps to determine a person's eye color. Therefore, the more melanin you have, the darker your eyes will be. Blue, gray, and green eyes are lighter because they have less melanin in the iris. Melanin also helps protect the eyes from the sun. Light eyes are more sensitive to the sun's harmful rays than darker eyes because they have less pigment. Interestingly, the iris also contains fibrous tissue that forms a unique pattern in your eyes. Iris patterns are now being used for personal identification, just like fingerprints. In some banks, iris scans have replaced pin codes for identification. How is eye color ultimately determined? Scientists once believed that eye color was determined by a single gene, with brown eyes being dominant over blue. We now know that eye color is actually determined by multiple genes, particularly the OCA2 and HERC2 genes, which are located on human chromosome 15. These two genes come in two different versions, or alleles. If the two alleles are different, only one is expressed and is considered dominant. The unexpressed one is referred to as recessive. Brown eye color is dominant to green, and green eye color is dominant to blue. Therefore, blue eyes can only occur when all four alleles are blue. Besides the two important genes, at least 10 other genes also affect eye color, as well as several interactions between the many genes. Many expectant parents wonder what color their baby's eye will be. It seems logical that two blue-eyed parents would only be able to produce blue-eyed babies. However, eye color determination is much more complicated. Eye colors don't result as a mix of both parents' eye colors. Many genes are at play from each parent, so eye color is a game of chance. Scientists predict eye color by entering the parents’ eye colors into a graph called a Punnett square. A square diagram, the Punnett square is named after Alexander C. Punnett and is used to determine the probability of an offspring having a particular genotype. The tool produces possible combinations of alleles from the father with alleles from the mother. The tables can produce the odds or probabilities of a baby's eye color by plotting various combinations of alleles in the graph. In this way, the odds of eye color options can be calculated. As an example, if both parents have blue eyes, but are carriers of a brown gene, according to all the potential combinations using a 2-gene model, the child will most likely have blue eyes, but has a one in four chance of having brown eyes. Brown is the most common eye color in the world. Over 50 percent of people worldwide have brown eyes. People with brown eyes have a high amount of melanin in the iris, which is determined by genetics. The more melanin in the iris, the darker it appears. Sometimes brown eyes can appear black. As you can guess, brown is the most dominant eye color. Two brown-eyed parents are most likely to have a child with brown eyes. Blue and green eyes are genetically recessive, so they are much less common worldwide. In fact, it is estimated that less than 10 percent of the world's population has blue eyes and only 2 percent has green. Blue and green eyes have an absence of melanin in the iris. Both colors are formed when light is reflected off the iris and scattered around. Green eyes appear green because of golden tinted melanin. Hazel eyes appear to be a light brown color with a green-yellow tint. People with hazel eyes have more melanin around the eye's border, which can make the eye appear to sometimes alternate between copper and green depending on the lighting. About 5 to 8 percent of the world's population has hazel colored eyes. Amber eyes tend to have a strong yellowish, golden tint. Amber eyes are rare and look similar to hazel eyes, but contain specks of amber or gold. They may also contain a series of flecks and ripples. Amber eyes may also contain small amounts of light gold and gray color. Silver and gray eye color is also rare and sometimes considered to be a variation of blue eyes. Like blue eyes, silver eyes are the result of a very low amount of pigmentation in the eye, which reflects a grayish, silver appearance. Though rare, sometimes a person can have two different colored eyes. Heterochromia is an eye condition in which one eye is a different color than the other. It is a result of an excess or lack of melanin within the iris. Heterochromia may be inherited or acquired by disease or injury. Many infants are born with blue eyes, only to have them change after several months. Baby eye color is very likely to change over time. Permanent eye color is not set until a baby is at least nine months old, so wait until your child's first birthday to determine what color they will be. Even then, you may still see your baby's eyes change colors. Subtle color changes can occur until about three years of age. For example, green eyes my slowly turn hazel or hazel may slowly grow to a darker brown, depending on how much melanin the body begins to store in the iris. McDonald, John H. Myths of Human Genetics, Eye Color: The Myth. Sparky House Publishing, 2011. White D, Rabago-Smith. Genotype-phenotype associations and human eye color. Journal of Human Genetics, 2011. Boyd, Kierstan. Eye Color: Unique as a Fingerprint. American Academy of Ophthalmology, 5 Dec 2017.